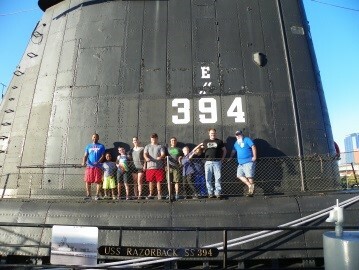 Groups are welcome to book a visit to the museum with a guided tour of the submarine USS Razorback (SS 394). Reduced rates are available for groups of 8 people or more. All groups must pay together to receive the group rate. Groups must bring 1 adult (over the age of 18) chaperon for every 10 minors (under the age of 18). Children under 5 years of age are not permitted on the submarine for safety reasons. Schedule your group Wednesdays and Thursdays 9:30 am to 2:00 pm and Fridays through Sundays during our regular operating hours. Please reserve your group at least 48 hours in advance. Dates and times must be confirmed in advance and are subject to prior bookings. Teachers and Home School Educators please visit our education page for activities and lesson plans. Please contact the museum staff for more information (501) 371-8320 or info@aimmuseum.org.